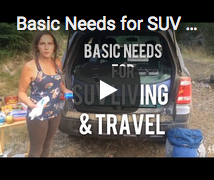 We’ve been living in a Ford Escape Camper Conversion for around 2 years. 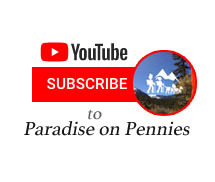 We traveled from Arizona to Alaska, exploring North American mountains, canyons, rivers, & lakes. We’ve met interesting people along the way, collected some incredible stories, & had our share of “Oh S#!%*” Moments! Now, It’s Time to Say Good Bye to the Great Escape SUV Camper! 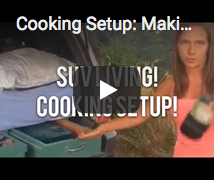 SUV camping is a great way to travel and live on the road on a budget. 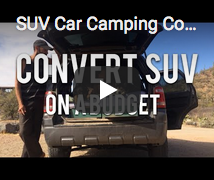 It’s easy to convert an SUV into an SUV camper rig on a very small amount of money. 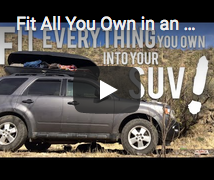 If you know Our Story, you might know that we already had a Ford Escape before we decided to live on the road full-time. This is really why we chose it as our road rig, and for no other reason. Fortunately, for us, it was four wheel drive with decent enough clearance for our off-road adventures. Here’s the 2nd SUV camper conversion we built. This one was for the long-haul. Why Are We Saying Good Bye? It’s time to get a new rig for living on the road full time. Yes, we’ve decided to stay on the road for life. We’ll be living and working on the road to eternity. Truck Camper, SUV or Van? Here’s Why We Chose Truck Camper Life !